Well then, this is rather unfair. 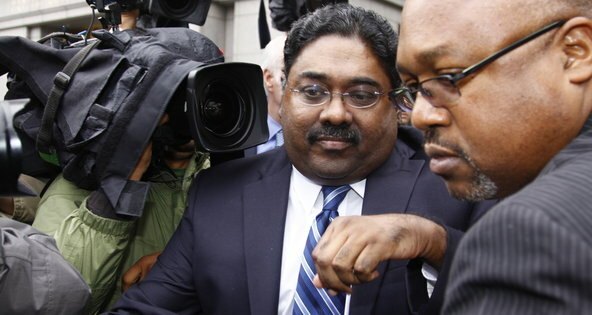 The sentencing of hedge fund manager Raj Rajaratnam to 11 years in prison for his insider trading conviction highlights once again the seriousness of this offense in the US legal system and, for some, revives the debate over whether it should be so. Mr. Rajaratnam, who will soon rub shoulders with Bernie Madoff in the Butner, NC federal prison, used a network of experts in selected industries to "find an edge" in his investments. Such experts really comprised a network of well-placed tipsters, US Attorney Preet Bharara convinced a Manhattan jury. To those who would argue that insider trading is a victimless crime, one could point out that every inside trade has a counterparty unaware of the underlying material, non-public information, who is thus cheated out of the full value of the traded stock; in Mr. Rajaratnam's case, the defrauded values were in the millions. Thank you, Madeleine! I'm proud to add another verse to Dr. Goose and MadKane.